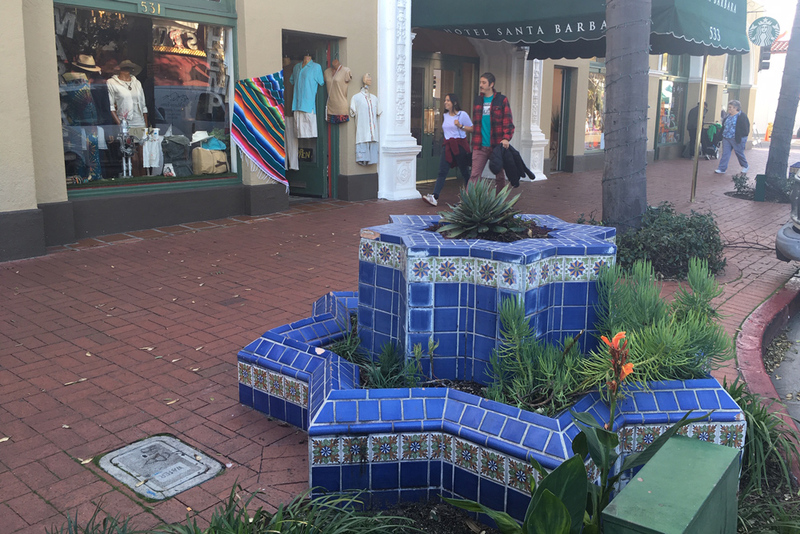 The city of Santa Barbara plans to remove two fountains in front of a downtown hotel — reversing a decision by the Historic Landmarks Commission. City staff and the owners of Hotel Santa Barbara on the 500 block of State Street said that the fountains are dilapidated and unattractive nuisances that invite loitering and crime. “They are broken. They are ugly. And it’s time for them to go,” said Tamara Erickson, owner of Hotel Santa Barbara. The council voted 6-0 to remove the fountains. Councilwoman Kristen Sneddon was absent. The tile fountains were built in 2007, and originally contained water, but the city turned off the flow in 2014 because of drought conditions. Now the fountains are full of plants, which regularly get trampled by loiterers who sit on them. The plants have been replaced five times in the past year. Some of the behavior around the fountains is much worse. Erickson said people regularly use the structures as a bar, a toilet, or a satellite locale to sell drugs. In the past year, there were 134 calls for service on the block, and 42 percent were related to the fountain. The request to remove the fountains comes at a time when the city is frantically looking to revitalize State Street after an exodus of retailers and restaurants over the past few years. While many observers blame online shopping and property owners who are demanding high rents for spaces, the city's longtime battle with homeless people and loiterers continues to vex city leaders and downtown businesses. The fountains themselves are chipped, with faded paint. "The fountains, once they didn't have water, they became debris basins filled up with cigarette butts, candy wrappers and who knows what else," said Historic Landmarks Commission member Bill Mahan. Erickson delivered a convincing presentation in which she showed images of inappropriate behavior at the fountains. Rob Dayton, the city's transportation planning and parking manager, said that the structures cannot be moved and should be demolished. "It's really not practical to move the fountains," Dayton said. "Trying to move them would be more expensive than building them again." The fountains will be replaced with flat sandstone in a similar star-shaped pattern. "I am a supporter of the arts," said Councilman Oscar Gutierrez. "I appreciate the initial beauty of the fountain, but it's not what they represent anymore. It's a public-safety issue."